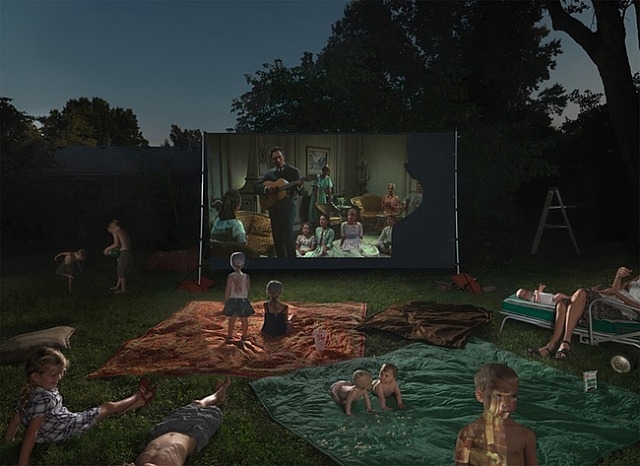 Julie Blackmon: The Power of Now and Other Tales From Home, is the current exhibition at Houston Center for Photography until April 22nd. Blackmon’s work is inspired by Seventeenth century Flemish and Dutch paintings, a subject she studied as an art history major in college. More curiously, she also cites illustrators like Edward Gory and Tim Burton as influences as well as her own family and friends’ families. When asked about the content of her work, she cites the Italian director Fellini: “The things that are most real to me are those that I imagine.” Indeed, her work brings a sense of the sublime to the most mundane scenes; the images reflect a world that is peppered with magic and beauty. One of the factors that gives her work this surreal quality is her use of the light box. This is a uniformly lighted, boxlike object that sits behind the photographs. The enveloping light source gives a crystalline quality and heightened sense of feeling to subjects that could rightly be considered not “art-worthy” such as children with lost mittens in the snow as seen in Lost Mitten. Her use of light recalls Seventeenth century Baroque paintings where tenebrism and chiaroscuro (the emphasis on contrasts of lightness and dark) were exaggerated to create a sense of drama. In Counter-Reformation Italy and Spain, artists used light to elevate religious subject matter to a mystical level, while the Dutch and Flemish artists mostly used tenebristic light to heighten scenes of every day life. Vermeer was a master of creating mood in simple scenes through this method. 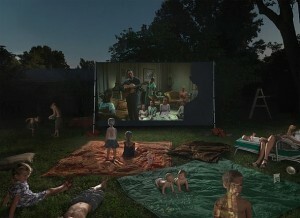 Blackmon also focuses on simplicity of subject matter in her depictions of the modern, middle-class American family. Her subjects are almost celebrations of mundane moments that many of us have stored in our memory banks. In Baby Toss, a father has just tossed his terror-stricken toddler into the air. We see the baby’s horrified face and tiny limbs suspended in midair, frozen in time by a “Kodak” moment. All of Blackmor’s photographs seems carefully coreographed and composed in a way that seems more fitting for a timeless painting than a snapshot of a moment in time. The juxtaposition of carefree innocence and sinisterness make these works an original take on a timeless theme.